Our followers directed various criticisms on our article published on November 7, 2018 about the claim that the wife of President Erdoğan, Emine Erdoğan made a wrong move in a chess game. It was claimed in the photo shared on social media that Emine Erdoğan made a wrong move while playing chess, and the related photo was shared a thousand times on the news sites and social media. We focused on this question and discussed why our readers had such a question in their minds, together with the question that what kind of a transparency model we should adopt to clear the air for our readers. 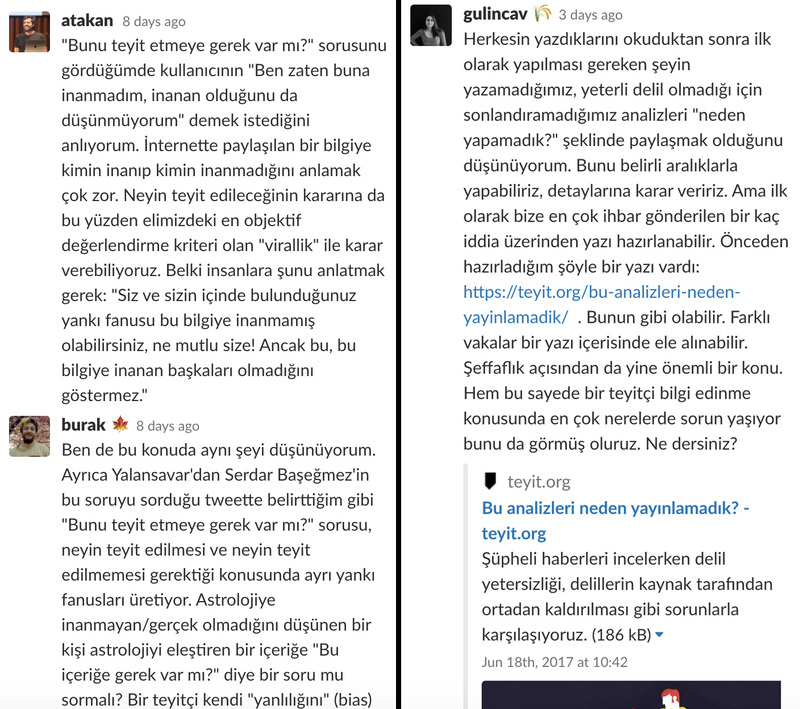 The following comments you will read directly reflect the flow of a discussion initiated on the Slack channel of teyit.org. To make our editorial processes transparent, we will publish our discussions on the decision we took, in this format without making any correction (other than spelling errors). For your interest: Thread 1: Why did we verify reports on Ara Güler’s death? Burak [Engagement Editor]: Hi everyone. One of the most frequently-asked questions in some of our published analyzes is “Did it need to be fact-checked?” As the team, we often address this question. What are our opinions about this subject? Does society believe in the same things and think that the same things are fake? Who receives fake news? Should a person say “Did it need to be fact-checked?” for a claim just like another person who questions the fact-checking need of that claim? Burak: I agree with Atakan in this respect. As I mentioned referring to the tweet of Serdar Başeğmez from Yalansavar team which is a platform formed by the enthusiasts of critical thinking and science, “Does it need to be fact-checked?” question generates separate echo-chambers based on what needs to be confirmed and what does not. Should a person who does not believe in astrology ask “Is this content necessary?” about a critical review about astrology? Should a follower of teyit.org determine his/her “bias” towards a claim, considering the number of people who believe in the claim? We published an article about a research on our page. It was suggested in this research that there is a rumor in which everybody may believe, and the possibility to believe in such rumor does not depend on educational background, gender or residential area. Mert Can [Writer]: I find the tendency of people to prioritize particular subjects quite normal. Nevertheless, such lists of prioritization get more and more solidified when people are confined to certain social environments and avoid contacting different people from other social groups. In this process, those individuals become more conservative with regard to their opinions. Of course, I do not mean a sort of political transformation by saying “becoming conservative.” It means showing resistance to change in the existing intellectual patterns over time and ignoring external influences…Ultimately, this behavior makes us interpret the world only from our bounded perspective. More dangerously, it blunts our critical thinking ability. At this point, comments such as “Did it need to be fact-checked?” come into play. As we approach a claim, we predicate the claim on objective criteria such as its prevalence and try to eliminate our potential “biases.” In this regard, I do not think that the problem originates from our team. On the other side, such questions may be asked with reference to the perception that we have common biases. Therefore, we may have to reflect our criteria and methodology used to choose a case more transparently so as to overcome that kind of approach of our follower. Gülin [Editor-in-Chief]: As Mert Can state, we should give the clearest answer to the question “Which factor determines our decision to review the analyses?” The influence of echo-chambers is still ambiguous, as discussed. Do individuals ask the so-called question referring to the information cluster to which they are subject in this discussion or do they lose confidence because of not seeing what they want to see? It is inevitable for Teyit to endeavor to create more reliable status if people follow and trust those who think like them. Although all of us have tendencies and interests, we do not choose or publish the analyses in consideration of them. We should show our followers that we are not occupied with only “those”. We try to express in every interview that preparing an analysis may take days and even weeks, and we may not come up with a result every time. Many factors which we cannot control (insufficiency, indifference, and unavailability of resources etc.) play role in this situation. Another matter which makes me think in relation to the reactions of our followers is whether they realize our effort to spread different ways of thinking in our analyses or not. In my opinion, we sometimes have trouble explaining this aspect. 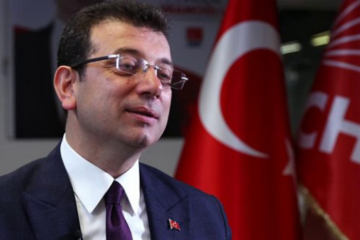 For example, social media and news agencies touched on the claim that Emine Erdoğan made a wrong move in a chess game through opinion columns, tweets and so on. However, when it comes to verifying this, everyone mentioned its futility. Actually, we decided to verify this claim based on the prevalence of the suspicious content as we act for any false information. The “instant” picture which you saw during the writing process of an analysis may not reflect the whole picture. In the case of Emine Erdoğan, we primarily told this point. Later, we showed the possibility to demonstrate something else, using different tools and methods. For instance, chess simulation of Ali Osman was didactic and fun. It indicated that verification tools may emerge out of even our daily entertainment. Another point to be emphasized is that any false information which a group/person finds “unimportant” contains polarizing elements. Perhaps, we cannot notice the “critical” matters debated on social media. Nevertheless, we receive over 20 messages from various echo-chambers, so I think that we do not miss too many points. I suggest that we can clarify the difference between a news site and a fact-checker. I think that the logic behind the question “Does it need to be fact-checked?” is “It does not matter whether it is true or false.” In the case of Emine Erdoğan, this question refers to “So what if Emine Erdoğan made a wrong or right move in a chess game?” Many social media accounts and news sites pit one against another to say “Wife of the President does not know to play chess” looking at her photo taken in the chess game. “The other side” acts in the same way, using the names of the opposition side. As Teyit, we try to reveal what both sides did, on the basis of false information. Of course, our work is significant, but a majority who do not already believe in actions of “both sides” for years may ask us “Why are you occupied with such things?” when they see our verification. Ali Osman [Editor]: From my standpoint, a limited number of people might object to the saying that “The world has become a global village.” Even though we share numerous things in our world, it does not mean that the whole world does the same things at the same time. Many people think that January 1 is the first day of the year. However, January 1 is not the first day of the year from the perspective of Mayas, Jews, Arabs, Chinese, and several other communities. Even if we live on the same earth and are illuminated and warmed by the same sun, north in the South Hemisphere is actually south. That is to say, everyone around us does not have the same perspective. This point is valid for the internet environment as well. As you mentioned above, every time, we strive to explain the factors that direct us to conduct an analysis, and causes of the analysis. Furthermore, to avert the question “Why was it made?” Burak adds several images to articles in order to create virality effect. Alican [Writer]: This topic is being discussed in our office almost every day, so we have already similar thoughts. However, I would like to touch on a few points. I sometimes think that the group of people who shares suspicious posts is not the same group of people who follow us curiously. As a matter of fact, our aim is to spread critical thinking and to bring these two different masses together. Unfortunately, receiving comments such as “Did it need to be fact-checked?” makes me think that we have a long way to go. Because the person asking such necessity may not be familiar with emotions and ideas of the members of the echo chambers who assert claims on social media even if that person speaks the same language and has the same history. At this point, critical thinking triggers “curiosity” factor and makes an individual wonder what’s going around. In fact, all of the analyses ultimately teach people a lot of things about life even though the necessity of the analyses is questioned. Another dimension of this question may be related to political distrust. The street interview about us demonstrated that our citizens do not believe in the objectivity and neutrality of media institutions and organizations. An analysis about a subject which is different from the political view of a person may be evaluated by that person as “makers of the analysis serve to x person, so they are occupied with such unnecessary things not to get reaction.” As a reflection of grudge and anger spreading the whole society, the opposition will say “This is unnecessary. You deal with needless things” since they think that we do not criticize the government. In my opinion, this is pretty usual. We should tell our followers who regard themselves as opposing party that we are different from a news site. Such negativities will be eliminated if we succeed in spreading critical thinking and we can tell the intention of teyit.org better. According to me, the first perspective is refuted by figures. False and fishy news is occasionally shared by hundreds of thousands of people. Such news which can access different echo chambers when confirmed are valuable with their potential for teaching critical reading to people regardless of their “importance”. In short, the more people are reached the more likely it becomes to obtain positive outcomes with respect to media literacy. It can be roughly estimated that 90 percent of the owners of the second perspective moan about non-political content. In such a polarized country, expectations from an institution like teyit.org whose neutrality and “umpiring” ability are acknowledged by a large number of people are unfortunately limited with the subjective thoughts of the communities. They think that teyit lies when teyit draws a conclusion in favor of their counterparty. I consider that the answer given to the first perspective at this point meets this aspect partially; becoming viral is significant as an objective criteria. Namely, it is “necessary” if it can reach many people. Furthermore, we may have to highlight more clearly that teyit.org is a fact-checking platform and differs from the traditional media tools. teyit.org resembles neither Birgün nor Sabah. In addition to its different objective, it does not have the same social and financial opportunities as those platforms. teyit.org does not employ journalists. It has limited staff. It is not a crime scene investigation as well. Such opportunities may come to the fore in a country with inaccessible sources and inadequate information. Sometimes, I could not verify the notices which touched on internal politics and hurdled the obstacle of “Was it necessary?” due to the deficiencies I mentioned above. Perhaps, we need to underline the difference of teyit.org from other media tools and limits of fact-checking. Selin [Project Assistant]: I would like to think from the perspective of readers like Sinan. According to me, the reader wants to benefit from the information provided in his/her life. He/she asks how such information changed my life. All of us are familiar with the question asked to teachers: “How will this information be useful in real life?” I consider that there is a problem with our relationship with knowledge. Definitely, it results from the matters in our education system to some extent. But this topic requires a more comprehensive and longer discussion. Consequently, we should emphasize that teyit aims to give a critical perspective to readers by using real photos or videos to convince them as well as searching for the truth or fallacy of a claim. People may say “What is this BS?” when they first see some of the claims. But if you approach a video or a photo which is apparently true or false from a different viewpoint, the claim becomes indistinct and unimportant in the eyes of the reader or you offer an utterly different perspective even though the claim is not shared in chamber of the reader. Thus, the perspective takes precedence over the truth or fallacy of the claim. Hence we should always seek different perspectives in our verification methods and continue to make each chamber collide with another one until no chamber is left. For your interest: Why didn’t we publish these analyses? Different cases may be addressed in a single article. This is significant with respect to transparency as well. Thus, we can see the issues that a teyit member confronts most frequently. What about you? Sinan: It’s a good idea. Alican: It sounds good for me as well. Furthermore, the monthly / bi-monthly/periodical articles about “what we couldn’t do” can be more informative than a usual analysis. Readers are informed about the presence of inaccessible and unreliable sources as well as the reliable ones. 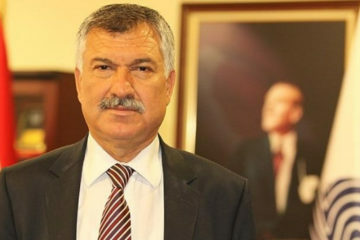 Şükrü Oktay: I agree with you. It will be better to do this weekly. We can prepare one-paragraph text for each uncompleted case. Burak: Considering the criticisms brought to us, and our opinions within team, I see that we have not completely reflected the background of our work process on our platform. People think that we do not investigate the actual claims. Some of the readers do not see or do not want to see the truth due to their political bias. We can change the view of this audience., I think we should tell more precisely that teyit is not a news site and it focuses on fact-checking which is one of the fundamental principles of journalism. It is unlikely to verify some of the claims because of insufficient evidence, insufficient open source data or inaccessibility of evidence. Besides several claims do not contain verifiable propositions, so they cannot be verified. Sometimes, we cannot publish a claim from which we get no result even if it takes days. Readers may think that we do not strive enough. For this reason, sharing our findings about the claims we analyzed with the users at certain intervals will make our platform more transparent as well as eliminating the doubts of readers about teyit. 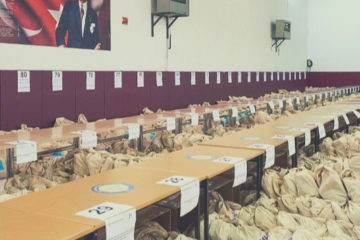 CONSEQUENTLY, as teyit.org, we understood that we have not sufficiently informed our readers about the difficulties we faced during fact-checking process of a claim. We decided to open our backroom to them by periodically sharing the findings which were analyzed, but could not be published due to several reasons. Lastly, we met on a common ground that we should find better ways to show various verification methods which we use while writing an analysis.